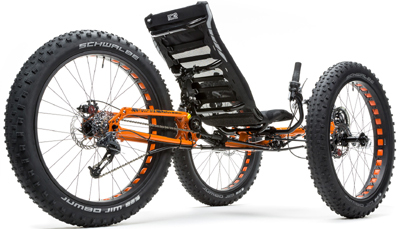 The ICE Full Fat is the ultimate all-terrain trike, with fat tires and full suspension. Expedition tested and ready for anything. 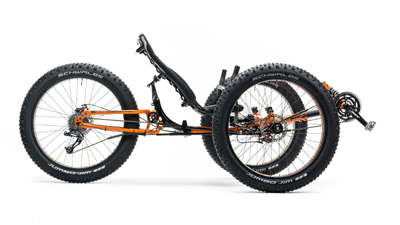 There are a few of these fat-tire trikes on the market, but none as compelling as the ICE Full Fat. 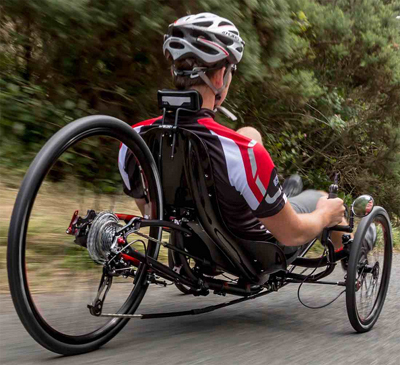 It is the only full-suspension fat trike available, and it was developed for a Welsh adventurer making the first cycling trip to the south pole. Maria Leijerstam set out at the same time as two other contenders on fat-tire mountain bikes (two days behind, in fact), but reached her destination weeks ahead of American Daniel Burton and Spaniard Juan Mendez Granados, both of whom chose fat tire mountain bikes. 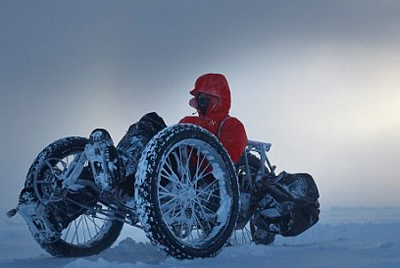 Liejerstam had tried two fat wheels on a ride across the frozen Lake Baikal in Siberia, and learned how high wind made balance a challenge. 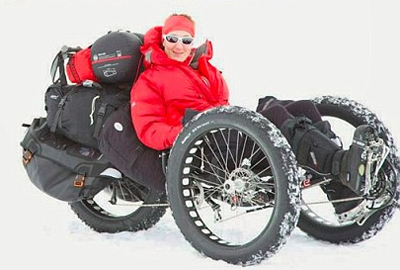 So she contracted ICE to build the first Full Fat and discovered not only the aerodynamic advantage of riding a recumbent into the wind, but also the fact that she could climb steeper slopes since she didn’t need a minimum speed for balance. This let her set a more direct, but rugged course, to the pole. 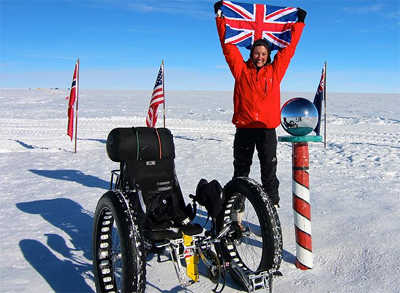 She finished in 10 days, while the first bike made it in 50 days. Dang. We’ll grant that you probably aren’t looking to do anything so crazy, but why compromise? The short of it is that this trike will cross just about anything. So if you have land and you want to move about it freely on your own power, this is the ideal trike. There are less costly choices, but none better. ICE’s elastomer suspension system isn’t the most exotic, but it is simple and robust, and when the time comes very easy to service and replace the elastomers. 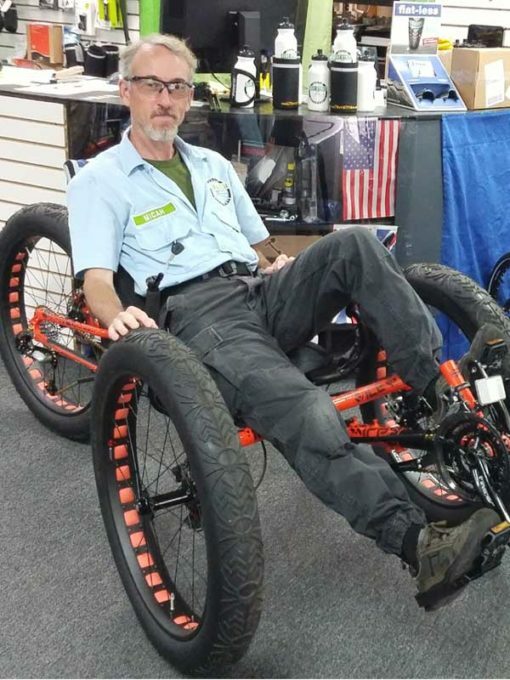 The fat-tire trike trend started with TerraTrike, who built a fat-tire 20″ wheel model of the Rambler and brought it to one of our rallies a few years back. (They had just made it over the winter and wanted some pictures without snow in them.) That idea morphed into the All Road design. 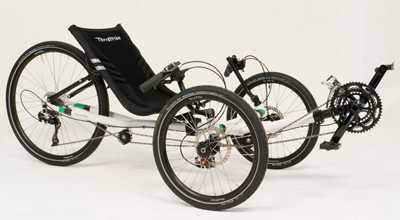 AZUB makes a fat trike, as do some mail order companies, but none are like the Full Fat. This is the only fully suspended one, and it is the only one with this back story. The bike industry is full of racing bikes that are indistinguishable from each other except that so-and-so won such-and-such a race on this bike. I guess this is much the same, but sheesh what a story, what an athlete, what a race! And she’s from Wales?! But here in the ‘bent biz we’re used to see people think outside the box more often than not. Our price: depends on spec, but generally $4,700 to $7,300. Tyres — Schwalbe Jumbo Jim, 26 x 4″ all around.